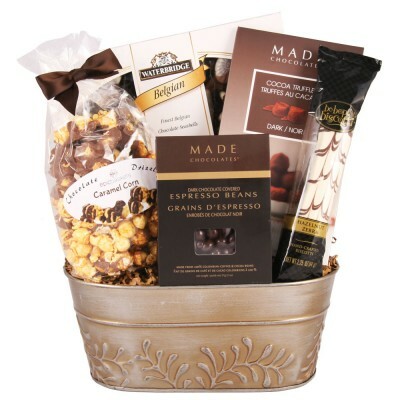 This basket features a wide array of goodies including fine Belgian chocolate seashells, cocoa truffles, hazelnut chocolate covered biscotti, dark chocolate covered espresso beans and chocolate drizzled caramel corn. These treats are sure to brighten the day of someone special. 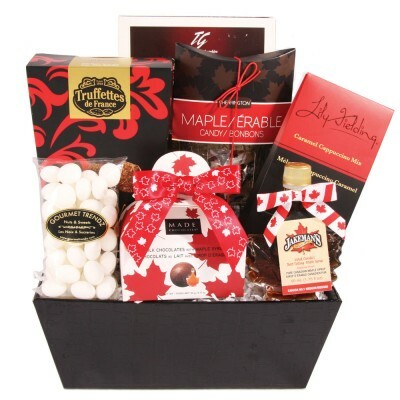 This sharable gift basket is full of exciting sweets! 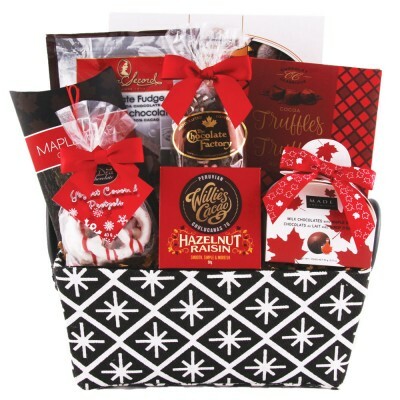 Chocolate almonds, honey peanuts, cocoa truffles, assorted chocolate cookies, chocolate drizzled caramel corn and many more tasty treats fill this basket. 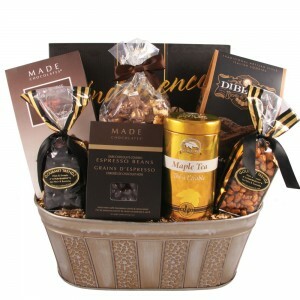 Convey your sentiments with this gourmet basket. This basket features an assortment of goodies including chocolate covered espresso beans, chocolate drizzled caramel corn, milk chocolate covered cookies, biscotti, Godiva hot cocoa, assorted candies and honey peanuts accompany crackers, cheese and olives that is sure to appeal to every taste. 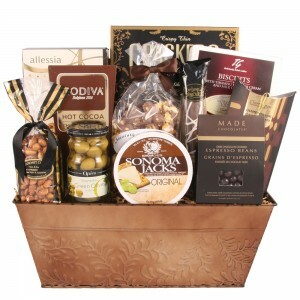 Impress your clients or friends with this gourmet gift basket. 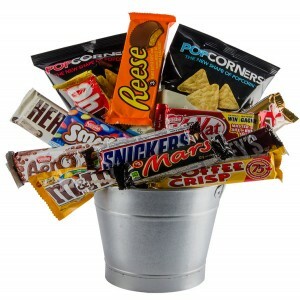 This shareable gift has a wide variety of delightful sweets. 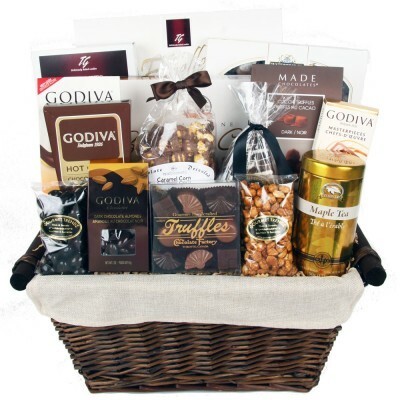 Godiva Masterpieces caramel milk chocolates, Godiva dark chocolate almonds, Godiva milk chocolate cashews, honey peanuts, fine Belgian chocolate seashells, chocolate pizza slice and more fill this contemporary basket. 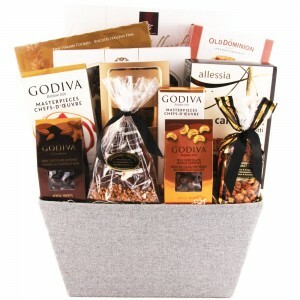 This gift basket is sure to impress with a lavish assortment of Godiva and other irresistible treats. 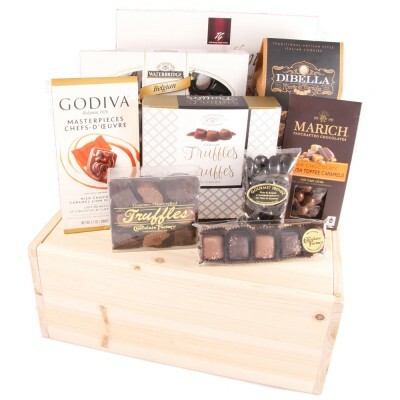 Filling this stylish wooden box are a variety of sweet goodness featuring Godiva Masterpieces caramel milk chocolates, Marich milk chocolate English toffee caramels, Chocolate Factory handcrafted chocolate caramels, fine Belgian chocolate seashells and delicious biscotti. This gift is expertly arranged in a natural wooden box with lid. 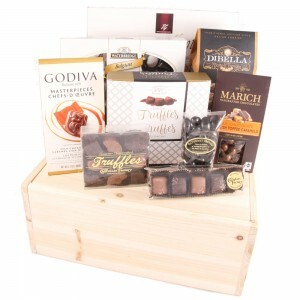 Sweet chocolates and goodies fill this stylish faux-leather box. 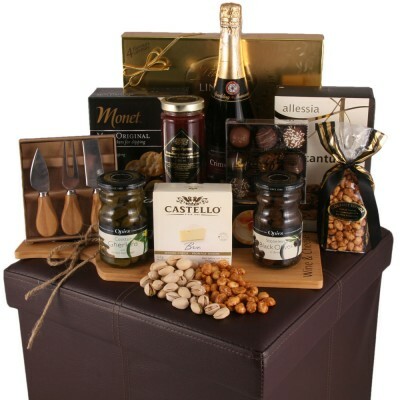 Chocolate Factory gourmet handcrafted truffles, Lindt Lindor chocolates, chocolate chip biscotti, black olives, cocktail gherkins, water crackers, assorted nuts, jam, cheese and more delights to enjoy. 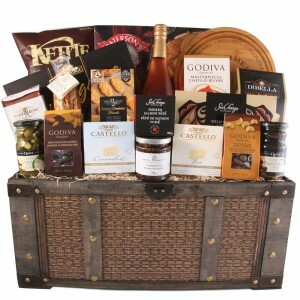 This lavish selection of sweet and salty items is sure to impress a group! This sectioned wooden tray is filled with sweet goodies such as Godiva Masterpieces caramel milk chocolates, Godiva Masterpieces hazelnut chocolate bar, Godiva hot cocoa, an assortment of dark chocolates, and a bottle of sparkling cranberry cider. 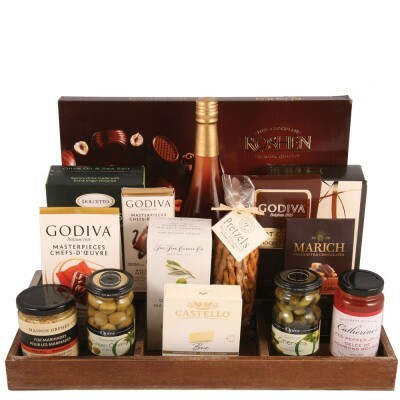 Accompanying the sweet delights, you will find a selection of delicious savoury items including butter flavoured pretzels, green olives, cocktail gherkins, red pepper jelly, crackers and more. 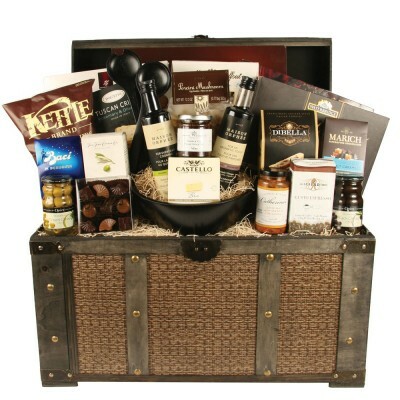 This large and stylish wooden keepsake trunk is filled with gourmet delights and chocolate treats that are sure to impress. Entice your sweet side with Godiva Masterpieces caramel milk chocolates, Godiva dark chocolate almonds, Godiva milk chocolate cashews, an assortment of chocolate biscuits and an assortment of shortbread biscuits and biscotti. 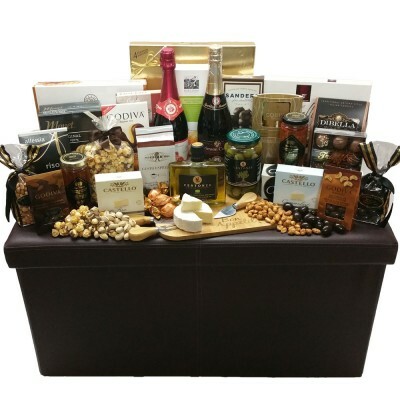 Then balance your palate with a savoury array, including SeaChange wild smoked sockeye salmon, SeaChange smoked salmon pâté, black olives, Camembert and Brie cheese, gourmet crackers, pretzels and so much more! This extra-large gift basket is sure to be a crowd pleaser! This splendid, keepsake wooden trunk is overflowing with goodies including an assortment of fine chocolates, biscotti, milk chocolate caramels, handcrafted truffles and more. 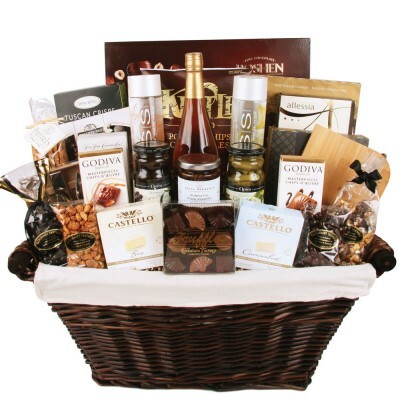 For your gourmet tastes you will find purple fig preserve, Brie cheese, antipasto, green and black olives, pasta, extra virgin olive oil and premium balsamic vinegar. A wooden bowl with serving spoons makes this an extra special gift.